Yesterday, I posted about a Fallout 4 mod that uses a complex, intertwining network of, er, kitties to make radios work. Turns out, game development is full of stories like that. World of Warcraft, for instance, is overrun with ghost bunnies. WoW encounter designer Nathaniel Chapman explained it to me via Twitter. Different games use different invisible creatures. 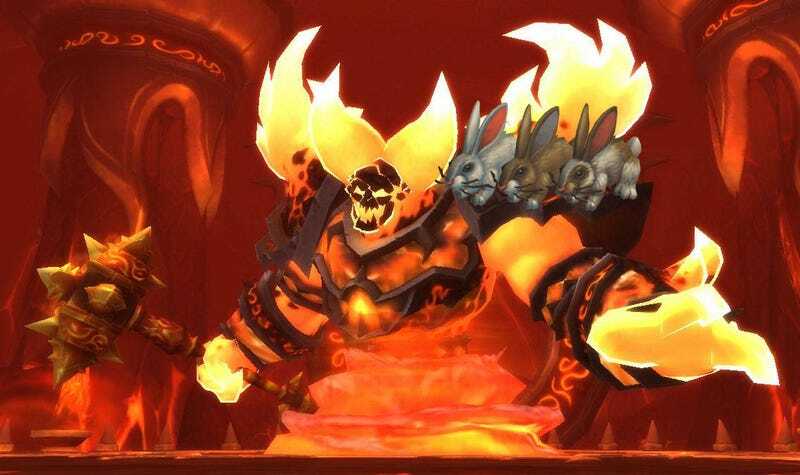 For WoW, it’s mostly bunnies. Chapman pointed me to a list of bunnies in the game, noting that every bunny on the list that’s not categorized as a “critter” is an invisible bunny oompa-loompaing around in the background of WoW’s endless chocolate factory. The list, I should add, is 1,000 damn entries long. These bunnies have some incredible names, too. For instance, there’s the Projections And Plans Kill Credit Bunny. I’m also partial to Pony Gun Bunny. So there you go. If you think you’re alone in your favorite game—quietly taking in the view, breathing the gentle spring air, and shouting your secrets as loudly as you can—you’re probably not. Beware the bunnies, for they see all.